As summer segues into fall, the blockbuster bombast gives way to quieter cinematic fare. "Quieter" being a relative terms when it comes to Marvel Studios. Their latest release, Doctor Strange, directed by Scott Derrickson and based on the character created by Steve Dikto and Stan Lee, is indeed quieter compared to its recent predecessor, Captain America: Civil War, in the way Guns 'N Roses is quieter in comparison to, say, Ghost or Slipknot. Strange acts as a departure from the Marvel standard as it explores soul-searching mysticism within the realm of super-heroics; an opportunity it never truly takes advantage of. Neurosurgeon Doctor Stephen Vincent Strange (Benedict Cumberbatch) is to medicine what Tony Stark is to technology, with personality to match. 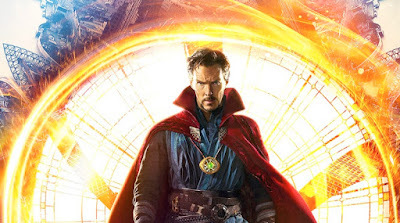 When an accident deprives the arrogant doctor the full use of his hands and effectively ends his career, Strange’s inability to accept his circumstances lead him to Nepal to seek the aid of The Ancient One (Tilda Swinton), who can purportedly succeed where medical science failed. In the process, he embarks on an esoteric journey even as he finds himself in the middle of a war between The Ancient One and Kaecilius (Mads Mikkelsen) whose outcome can determine or seal the fate of the world. The narrative follows the Clarke-ian principles as established in the Thor films, couching magic as a form of advanced science, perhaps to keep it grounded in believable terms (as believable as this universe allows, at any rate), but still maintains a foothold in the arcane. Of all the heroes rendered in the Marvel Cinematic Universe thus far, Doctor Strange had the potential of profundity, its premise a classic and intimate bildungsroman which could have transcended the conventions of the super-hero genre. The eponymous film does address these matters only cursorily, and cheekily tweaks them in a way that keeps the material from taking itself too seriously. After all, despite its mystical trappings it is, first and foremost, a crowd-pleasing actioner; not a lofty meditation of the human condition. The character and his world, as envisioned by Ditko and Lee, were reflective of the eastern mysticism and psychedelic zeitgeist of the sixties; something that the visual effects team was keenly aware of. The strongest facet of this film is that it’s a Technicolor marvel (pun intended), visually combining trippy, kaleidoscopic aesthetics of the source material with a decidedly modern representation. Think Inception on acid by way of Dali (as in Salvador, not the Lama). The effects team show remarkable imagination with images that brightly pop off the screen, especially in 3-D format. Rarely does a film in recent memory elicit “oohs” and “ahhhs”. This film is that rare exception. If only the story were as meticulously rendered. For a film whose subject matter is thematically intimate, it is almost…clinical…in presentation. Doctor Strange, more than most of the Marvel cinematic films, is a rite-of-passage story; a journey inward blanketed with Bruce Lee bon mots. Though replete with themes of mortality, time, egoism, and surrender, the journey still feels lacking. That is in no fault to Cumberbatch, who is thoroughly engaging in his role. He balances Strange’s arrogance with a sympathy that humanizes what could have easily been caricature. Unfortunately, Strange’s moments of epiphany and growth are stunted and glossed over, if not totally lacking. Without going into specifics, while the narrative story does account for Strange’s affinity for magic as the film progresses, the viewer investment of said epiphanies is lost, which undermines whatever resonance they could have had. He’s competent because the story requires him to be, and not necessarily because he’s narratively earned that competency. Regardless, its evident from his performance that he's enjoying the material, as solid an acting job as he's ever done and solidly anchors the film. That condition is not exclusive to Strange’s character arc. The film’s pacing stumbles. It’s like a sprinter: starts strong, moves at an even gait, and then suddenly rushes towards the finish line at a hurried, break neck pace. The ending feels rushed. By the same token, it’s a clever and beautifully rendered set piece that almost makes up for its unsatisfactory arrival. Unfortunately, the usually-reliable Michael Giacchino’s score for the film doesn’t quite distinguish itself outside of his other work. The story, locations, and themes practically scream for the use of more esoteric instrumentality, but the use of same, such as the sitar, is underused, with acoustical callback to the character’s ‘60s psychedelic beginnings reserved for the end credits. A shame, as a more comprehensive use could have elevated the action on the screen. Despite this, Giacchino’s score still services the film adequately. The performances of the actors do make up for the narrative shortcomings. The casting of Tilda Swinton as “The Ancient One” was controversial; decried as another example of Hollywood white-washing. While the move was said to be predicated by concerns over the loss of much valued revenue from China (as the source character was Tibetan in origin), the casting of the androgynous Swinton acts as a sort of compromise in maintaining the character’s visual aesthetic, while preventing the film from being a sausage fest. The other female character of note, Christine Palmer (Rachel McAdams), is just that close to being extraneous given the amount of screen time she’s given. However, McAdams imbues her character with competence and a center that makes it understandable why the magisterial Strange would be so taken with her, while Swinton’s Ancient One is by turns magnetic and inscrutable, which incongruously serves the story while undermining it in terms of her character’s arc and motivation. Chiwetel Ejioforas Strange’s mentor/companion Mordo, however, is possibly the film's most realized performance. To say more would be to give away a major development to the uninitiated. Suffice it to say, that his particular journey is believable in context due to the strength of Ejiofor’s acting. Benedict Wong’s Wong character serves, in a sense, as Doctor Strange’s version of Guardian of the Galaxy’s Drax the Destroyer...in a good way. Mikkelsen imbues Kaecilius with a sinuous subversion that almost makes the viewer question the justifications of his character’s actions, making for a villain above the Marvel norm. As to fealty to the source material, as with all Marvel film output, be prepared to be flexible. A few liberties are taken (especially with one core part of the lore), but the changes are not egregious enough for fans to call for director firings. Ultimately, the film is a blast, and the changes do not detract from that. Doctor Strange is a mixed bag with the positives far outweighing the negatives. Its stunning visuals merit viewing in 3-D and vibrantly embraces the colorful richness of its source material. Despite its missed opportunities and cliff notes presentation, Strange is a decidedly fun romp that alternatively respects its material even as it playfully winks at it. Good as it is, it could have been a greater film. It wins the game, but does so without achieving a home run, a rarity for Marvel. But then, stranger things have happened.